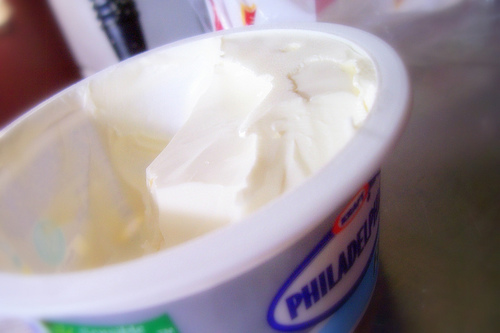 Food Costs > How Much Does Cream Cheese Cost? How Much Does Cream Cheese Cost? Cream cheese is a soft, mild-tasting fresh cheese that has a high-fat content, commonly used on bagels, crackers and as a dip mix for popular snacks. In grocery stores, cream cheese is often sold in an 8-ounce package, which can either be in a tub or as a brick. The cost for this type of cream cheese is usually around $0.99 to $2.50. The price depends on the brand, quantity and where you purchase it from. A store brand, such as Aldi’s Friendly Farms retails for close to $1, while Walmart’s Great Value retails for a pinch more. Food Club, a store brand offered at Food City, can cost about $1.50 on average. In bulk, containers often weigh close to three pounds, with prices in the $10 to $13 range. For example, at Costco, this 3-pound tub of Kraft Philadelphia cream cheese retails for about $10. If you were to buy it by the pound, then the cream cheese can be anywhere from $3 to $5, depending on the brand. Take a look at the most popular cream cheese brands at your local grocery store with the corresponding prices inside our table below. Cream cheese is sold in different forms and even flavors. Found in most grocery stores, bakeries and bagel shops, cream cheese can be purchased as a traditional “brick” style in an eight-ounce container or as a tub of soft or whipped cream cheese, usually in an eight or 16-ounce size. Aside from the original flavors, some specialty flavors can include garden vegetable, honey, jalapeno, strawberry cream, salmon, chives/onion, chocolate cream and even cinnamon. For the most part, these specialty flavors will cost just as much as the original flavor. Cream cheese should always be refrigerated to ensure that it will last longer. There will be an expiration date on each package which should be observed in order to avoid the product from becoming spoiled. Less expensive brands often add stabilizers like guar gum to get the necessary firmness because the high-fat content of the milk products is often prone to separating. Although it is dairy by nature, cream cheese has low protein content in contrast to hard cheeses. 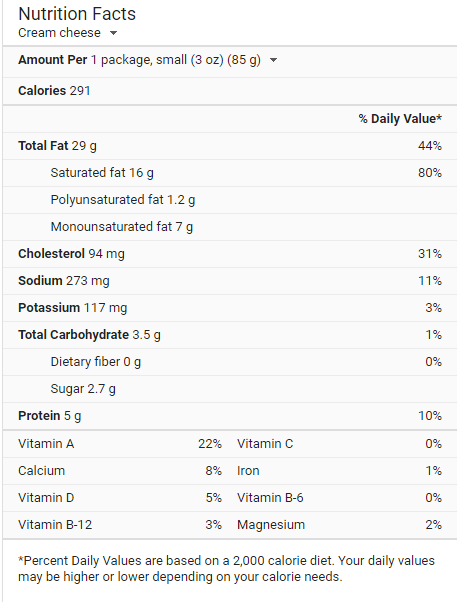 A one-ounce (28 g) serving only has 1 gram of protein. In addition, most traditional cream cheese can also be quite high in saturated fat, containing as much as 40% fat. If the cream cheese is too hard for your recipe or bagel, unwrap the amount of cream cheese you want, set it on a microwaveable-safe plate and continue to cook on high for up to 10 seconds. Store-branded cream cheese can taste just as good for about 30 percent less when compared to a name brand. If purchasing a name branded cream cheese, look for a coupon before buying. Many name brands offer coupons via social media, email newsletter and on the official websites.